Have you been sitting on remodeling your basement? Renovating your basement will not only add value to your house, but it also gives you additional livable space for you and your family. Imagine what you could do with all that extra space in your home. Here at Miles Bradley, we can help you create your ultimate entertainment center, game room, or man cave from your dingy basement. We will help frame, insulate, and get your basement into a livable state for you and your family. If your basement needs to be finished, hire Miles Bradley to help! Finishing the room DIY can be overwhelming and drag out for months. Between codes, proper licenses and just finding the time to do it, you might as well hire a professional. We can help you get the space you’ve always wanted as we are a fully licensed and insured contractor. We’ll take your old unfinished basement and help you design the basement of your dreams. Finish your Michigan basement with Miles Bradley! If you’ve never heard of the term “Michigan basement” we can paint you a picture: inhabitable. 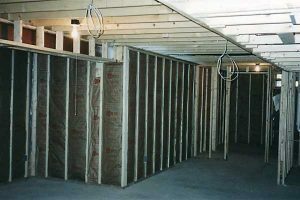 Hiring a professional contractor to finish your Michigan basement is a great way to make more room for your family. Whether you’re increasing your family size and need additional room or just better storage space for your stuff, we can help. We’ve helped finish basements to guest rooms, storage space, and the best place to catch the game with your pals.